Fayette/Westmoreland Forgotten History: Happy Thanksgiving! Soon the snow is accumulating and temperatures are dropping as moody Old Man Winter raises his gray head and shakes his wind rattled staff. We are nearing those tinsel and manger days of Yuletide with the seasonal changes of the solstice. This brings gifts and unfortunately, higher electric and fuel bills too, (Boo, hiss!) Also, introspection of the passing of another year of our lives. In this late fall period, let's not yet jump on the December bandwagon, as we may have a few prayers of gratitude to whisper in earnest and a special holiday right in front of our noses. For those of you in foreign countries that read this blog, you are probably aware this is an American holiday celebrated on the fourth Thursday of November with autumnal harvest traditions of religious overtones in giving thanks to God for providing for us and any abundance we have gathered. It has become a federal and public holiday here. The very first Thanksgiving celebration must of been something really special. 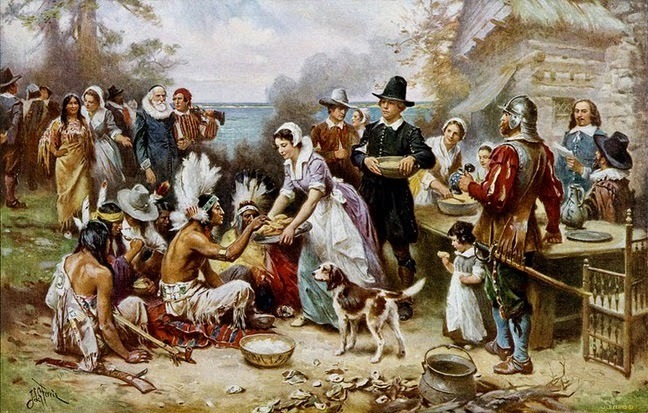 It was said to of been celebrated by the Pilgrim Fathers in 1621 in New England with various Native Americans. What are your youthful, idealistic impressions? President Abraham Lincoln issued a proclamation through the efforts of Sarah Josepha Hale, in 1863 for a national day of "Thanksgiving and Praise to our beneficent Father who dwelleth in the Heavens", making it extremely official. You would have to seriously doubt this kind of thing could be considered in our times with the modern misunderstanding of 'the separation of church and state doctrine, etc. Let it be stated clearly, there was no thought given toward a 'freedom from religion' back then. I can still recall the bustle of my grandmother and Mom in the heart of my childhood, preparing the turkey, stuffing and dressing, and the all encompassing aroma, and those grand pies, (my grandmother was the best cook I honestly ever knew of; her coconut cream pies were absolutely perfect!). Ah, no, I'm not quite old enough to remember the one horse open sleighs, bells on bob tails, or muskets and wearing of brown with high white collars. Can't comment there. But, I do get an inner glimmer of those mornings with early frost on the windows, bundling up in jackets and galoshes for some early sled riding. The doodles in school, a cozy hearth, drawing turkeys and a history lesson of the old days with stern Mrs. Laughrey at the Central Grade school. The solemn Thanksgiving prayers round the table before a scrumptious dinner that my Dad led us into every year, and the humble amens. While the orange and brown leaves whirled outside, fantasizing already of the coming Christmas magic and the hunting season and blending in...ahhh, it is a fair time ago and the nostalgia is palpable. I hope yours is not that much different, except for those tough old teachers! Some were kind of nice though, weren't they? These days, that tradition surely includes turkey, parades and college, (and Pro), football! Don't forget the stuffing and pumpkin pie either. I want to personally wish all of you a Happy Thanksgiving with family and friends and all the trimmings that come along with it for this November the 27th, 2014! In such changing and uncertain times as ours, here's to a grand old holiday with deep and abiding traditions.